'Unquestionably one of the highlights of the 2006 Snape Proms, their return promises ... colourful and exuberant performances' - from the 2009 Snape Proms brochure. Gustavo Dudamel and the Gothenburg Symphony Orchestra were one of the highlights of a previous Snape Proms season. But no, it is not dancing brass players that are back by popular demand. 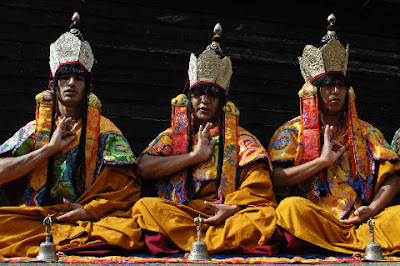 In August the monks of the Tashi Lhunpo Monastery in southern India return for another week's residency at Snape. This culminates in an evening of Tibetan music and dance in the Maltings, as seen in the photos here. There are also Tibetan culture workshops, lunches prepared by the monks, and a sand mandala. But, alas, there is no complementary performance of Britten's Buddhist inspired church parable Curlew River. Unlike today's made-for-mass-media BBC Proms, which take place at the same time, the Snape Proms still value the adventurous. Among the other highlights at Snape are Music from the Penguin Café with a band led by Simon Jeffes' son, Arthur, and Malian music featuring Madou Sidki Diabaté on the kora. Of course, there is also lots of excellent classical music, including appearances by the National Youth Orchestra (playing Lutoslawski's magnificent Concerto for Orchestra), the Belcea Quartet (performing Britten's Third Quartet, but a pity they are not also programming the Lutoslawski Quartet) and Marc-André Hamelin performing Alkan. 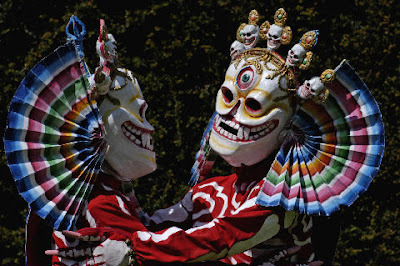 And if Tibetan monks and Alkan are not hair shirt enough for you, there is always the main Aldeburgh Festival in June with its new Harrison Birtwistle double bill. Cleansing the ears of the musically educated here.